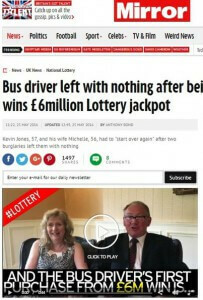 Two small steps backward and a huge step forward – this is the story of a bus driver whose twin misfortunes were wiped out by a significant lottery win. Kevin Jones and his wife Michelle were living in Spain when two burglaries in one weekend took everything they had. This caused them to return to the UK. Fast forward a few years later to the present and Jones is holding a ceremonial check for £6.1 million. The lucky winner now has much more than he had lost, thanks to one lucky dip ticket.